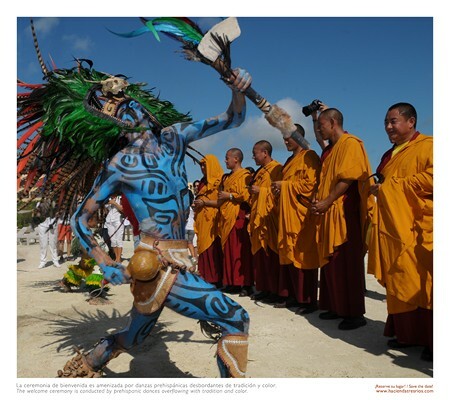 Be a part of the Second Mayan-Tibetan Bicultural Encounter 2012, where you can discover two fascinating cultures through dances, ceremonies and exhibitions with the presence of the Monks of the Drepung Loseling Monastery, representatives from Richard Gere Productions and Mary Cobá Cupul from Producciones Arte Maya. Don’t miss out on this singular opportunity to be a part of a spiritual reawakening at Hacienda Tres Ríos, an environmentally responsible resort that offers exclusive access to the Tres Ríos Nature Park in the Riviera Maya. Wil this event be repeated again in 2012? Yes! And it will be even more amazing this year! It would be great to learn more about both the Mayan and Tibetan cultures. I would love to experience it and write a review about it on my new website and blog. Cheers!! BECAUSE THE CULTURE IS SO INTERSTING AND WE WOULD LOVE TO EXPERIENCE IT FIRSTHAND. TO SEE SUCH BEAUTY AND LEARN MORE ABOUT SUCH AN INTERESTING AND SERENE CULTURE. A ONCE IN A LIFETIME OPPORTUNITY. Porque es una oportunidad única de apreciar la representación histórica del encuentro de dos grandiosas culturas que han pasado por nuestra tierra. Es la oportunidad de enriquecer nuestro conocimiento y espíritu con la simple acción de observar como ellos hacían las cosas. I would love to go to this encounter and it may be one of the few opportunities for me to ever see something like this in real life. I would love to experience this, looks like it’s going to be an amazing event! Because I was a art and history major and perform in theater, I would love to experience this event. I LOVE H.T.R.! I am an artist and history major and perform in theater, so I would love to see this event! I am interested in learning more about these cultures – particularly the Mayan. One of my grandsons is part Mayan and I would love to be able to teach him. It would also be awesome to experience the Encounter! What a truly unique experience! Just recently started dating someone, would love to take her to this incredible event! I have always loved the music and culture. To experience this event first hand would be a dream of a lifetime. Estoy convencida de que seria un momento inolvidable para mi acompanate que nunca ha tenido la oportunidad de conocer el paraiso maya y tampoco un hotel tan lujoso y exclusivo como es Hacienda Tres Rios. I would love to go to this event. I’ve never been to anything like this before, so this would be an absolutely amazing opportunity. It would be great to be able to experience and learn so much about the culture. The idea of a “spiritual reawakening” is definitely interesting and something that I would love to try. While in Akumal this month, I met a Mayan man who explained to me the meaning of turtles (which represent eternity and “todos”), as they are both amphibious and land creatures and have such a long life. We were making turtle sand sculptures when he approached me. While talking with this very spiritual gentleman, I became even more fascinated with the Mayan culture and we added the Mayan symbol for yin-yang/wholeness to the turtle’s shell. Also interested in Nepalese culture, I would love to experience this truly amazing and spiritual event! 2012 is significant in the Mayan calender so to see their arts and culture would be exciting; I’ve never seen a Tibetan puja ceremony so this would be a chance in a lifetime. Thanks. Será una oportunidad única e irrepetible, un gran encuentro entre estas dos culturas, en un lugar increíble, la idea de un encuentro así es impresionante, tanto conocimiento y armonía en sus culturas será algo que no te puedes perder. I would love to assist the event first hand, since last year I only saw it from behind the scenes as an employee. The reason I most wish to eperience this event is to learn more about the mayan belief system since I have decided to take these on since my wife is mayan and of course my son.I feel that it is our duty to continue to teach younger genarations the beliefs and wonders of the mayan culture as to not lose a culture that seems to hold the key to this changing world. Of course as someone who has been traveling in this spiritual journey I have always loved the tibetan culture for their peaceful and gentle ways. To experience them both first hand would be a dream come true…..
Me encantaría tener la oportunidad de ver juntas estas dos grandes culturas, cada una con una filosofía de vida grandiosa de las cuales tenemos que aprender cada día más, ya que en este mundo nos hace falta mucho mirar un poco hacia nuestras raices, para tener un amor más grande hacia las cosas “pequeñas” pero grandes en escencia como es la naturaleza, la paz interior, el respeto hacia otras culturas, y esto sin duda nos hará mucho mejores ciudadanos y podremos aspirar a vivir en un mundo mejor. Ojala tenga la oportunidad de asistir a este maravilloso encuentro. Quiero ir al encuentro de la Cultura Maya y Tíbet, para saber de más de estas dos granes culturas y que mejor que ir a la fuente y en un lugar Maravilloso con lo es Hacienda Tres Ríos, además de que es un Año místico en la Cultura Maya. Espero contar con la Suerte de ser el Ganador. Un viaje para llenarse de paz y restaurar el alma. I know the spiritual energy there in such a magnificent place will enhance my life and spirit.